CHECK OUT OUR OTHER STORAGE CASES! BIGGEST STORAGE CASE ON THE CURRENT MARKET! BIGGER CASE, AT A SMALLER PRICE! This is a must have for all serious card collectors! These go fast so get your's now! This is very close to the construction and quality level of much more expensive cases. This IS NOT pelican brand. But is made very similar to the boxes they offer. Box design is example only. Actual product may vary in color and design. This Can Fit nearly any size card/cases. I have personally stored both PSA and BGS graded cards, as well as cards in standard top loaders, top loaders with team bags. Card savers, one touches, 5x7 over sized cards. These can hold up to nearly 200 psa cards depending on how you custom the inside. About this item - Press and pull latches - Built in pressure-release valve - Padlockable for added security - Shock-proof, waterproof, dust-proof, temperature-resistant -Can hold 170+ PSA cards. Description This protective box features foam inside and a customizable compartment to store all of your valuable goods snugly and safely. This safety box also includes a pressure valve that maintains internal and external pressures. Composed of a high-impact material and resistant to extreme hot and cold temperatures. This high-intensity, airtight, lightweight, and durable protective box will protect your collection and important documents and valuables in nearly any adverse environment as its not just for cards, but for anything you choose to store inside. 1/2 " x 16" x 8 1/2. 19 1/2" x 13 1/2" x 8. Shock-proof design prevents contents from being broken or damaged if dropped. Pressure-proof design prevents contents from being broken under pressure. 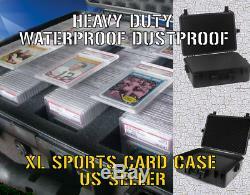 Moisture-proof design prevents the contents from rusting if box is submerged. Ring must be properly adjusted. And it's not recommended that the box is intentionally submerged, or submerged in water 12in deep or longer for a long period of time. Features a valve that maintains the balance between internal and external air pressure It has testing standards that reach IP55. Inside foam is composed of pick and pluck cubes on the top layer. It can be cut horizontally and vertically in order to create small cubes that can be plucked out. Surrounding foam can be customized to the shape of what you are storing in the case and use as a template for the next layer. The handle in the front allows for the box to be easily transported. Measure the cards you would like to customize the case for and count the number of cubes you should remove to fit your specific card set. Remove cubes all the way to the bottom of the case (otherwise your lid wont close). A knife/box cutter works really well to cut and shape the foam to your needs. Photo shown is for example only. Its purpose is to show you all the possibilities you can do with the inside. The foam inside IS NOT pre cut, but made of foam, and pick and pluck style foam that is pre-scored for easy seperation. This is also NOT a Pelican Brand, but is made very similar to the boxes they offer. The item "XL Graded Card Storage Box Display Case Holder Waterproof Lot PSA Pelican Like" is in sale since Saturday, March 2, 2019. This item is in the category "Sports Mem, Cards & Fan Shop\Sports Trading Cards\Storage & Display Supplies\Card Storage Boxes". The seller is "mizzashley0728" and is located in Beverly Hills, California. This item can be shipped to United States, Canada, United Kingdom, Denmark, Romania, Slovakia, Bulgaria, Czech republic, Finland, Hungary, Latvia, Lithuania, Malta, Estonia, Australia, Greece, Portugal, Cyprus, Slovenia, Japan, China, Sweden, South Korea, Indonesia, Taiwan, South africa, Thailand, Belgium, France, Hong Kong, Ireland, Netherlands, Poland, Spain, Italy, Germany, Austria, Bahamas, Israel, Mexico, New Zealand, Philippines, Singapore, Switzerland, Norway, Saudi arabia, United arab emirates, Qatar, Kuwait, Bahrain, Croatia, Malaysia, Brazil, Chile, Colombia, Costa rica, Dominican republic, Panama, Trinidad and tobago, Guatemala, El salvador, Honduras, Jamaica, Antigua and barbuda, Aruba, Belize, Dominica, Grenada, Saint kitts and nevis, Saint lucia, Montserrat, Turks and caicos islands, Barbados, Bangladesh, Bermuda, Brunei darussalam, Bolivia, Ecuador, Egypt, French guiana, Guernsey, Gibraltar, Guadeloupe, Iceland, Jersey, Jordan, Cambodia, Cayman islands, Liechtenstein, Sri lanka, Luxembourg, Monaco, Macao, Martinique, Maldives, Nicaragua, Oman, Peru, Pakistan, Paraguay, Reunion, Viet nam, Uruguay.